Following the announcement of his unexpected death, SRtRC reflect on the achievements and contributions of campaign patron & former England manager. The thoughts of everyone at Show Racism the Red Card and all those connected to the campaign are with the family and friends of Graham Taylor OBE after news of his death broke this morning. A former player with Grimsby Town FC and Lincoln City FC, Graham’s later years were intrinsically linked with Watford FC, where he managed between 1996 & 2001 and held the position of Chairman for a number of years. Graham also managed the England National Team between 1990-1993 and also had spells in charge of Lincoln City FC, Wolverhampton Wanderers FC and Aston Villa FC. In addition to his many successes within the game, Graham was a dedicated and long-standing patron of Show Racism the Red Card; first becoming involved in the campaign in as part of an anti-racism education event in 1999 during his second spell as Watford manager. Graham attended and ensured the presence four of his first team players. He was brilliant at the event and talked to the assembled audience of Primary School children from local schools about racism, his experiences in football and offered advice to anyone suffering from racism. Graham has since attended several SRtRC events and has been interviewed for SRtRC resources. He was inducted into the Show Racism the Red Card Hall of Fame in recognition of his contribution to the campaign in 2004. As recently as last season, Graham took part in the now annual anti-racism education event with Watford FC, alongside former Watford FC player Gifton Noel Williams, whom he managed, and current first team players from the men’s team; Aketchi Anya, Adlene Guedioura and Odion Ighalo and Mollie Burgess & Phoebe Read of Watford Ladies FC. Almost 18 years after he first provided his backing for the campaign, Graham had lost none of his passion for condemning racism in the strongest terms and encouraging young people to reject hatred and celebrate diversity. 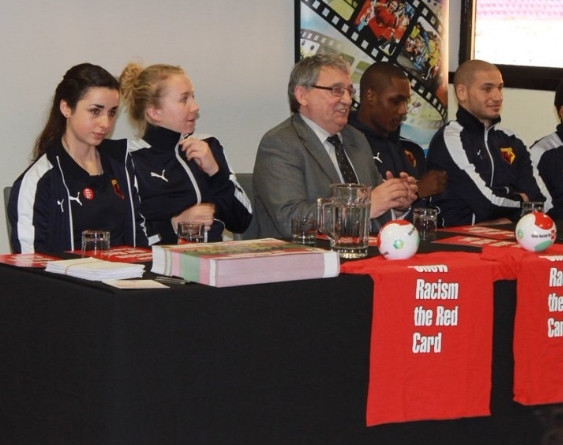 Footage from Show Racism the Red Card’s 2015/16 anti-racism education event with Watford FC highlights Graham’s enigmatic personality and commitment to ensuring that football and football clubs make positive contributions to local communities and wider society. Show Racism the Red Card sends deepest condolences to Graham’s family and all those who knew him, and remain extremely grateful for all of his contributions to challenging racism, both on behalf of the campaign and on many separate occasions throughout his life and career.